We spent 5 long, hard days to see this road. 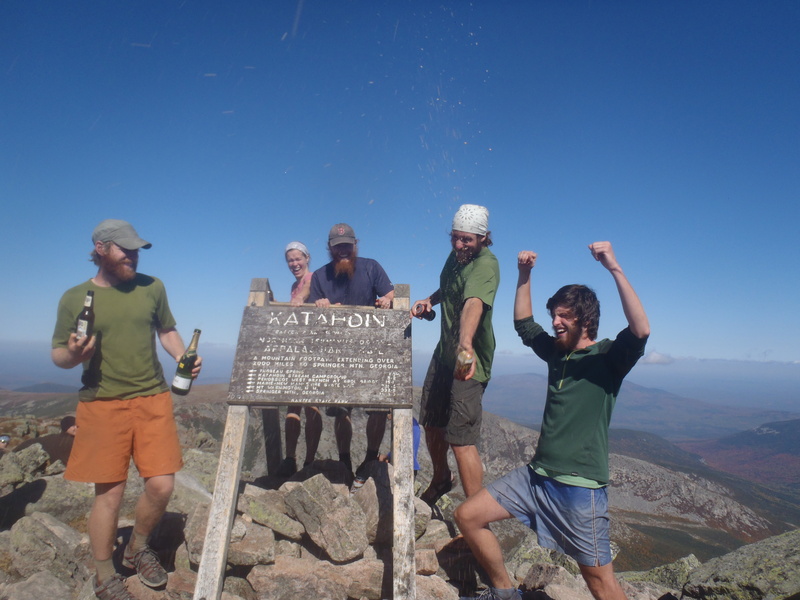 The story of us summiting Mount Katahdin and finishing our 2014 Appalachian Trail Thru-Hike starts 15 trail miles south of the infamous wooden sign on the top of Katahdin. This is the point where the trail crosses the Golden Road and the Penobscot River and where we left the 100 Mile Wilderness and re-entered “civilization”. Leaving the 100 Mile Wilderness and sitting down on a picnic bench at the Abol Bridge Campground, overlooking the fast flowing Penobscot, is when the realization hit us that our journey was all but over. 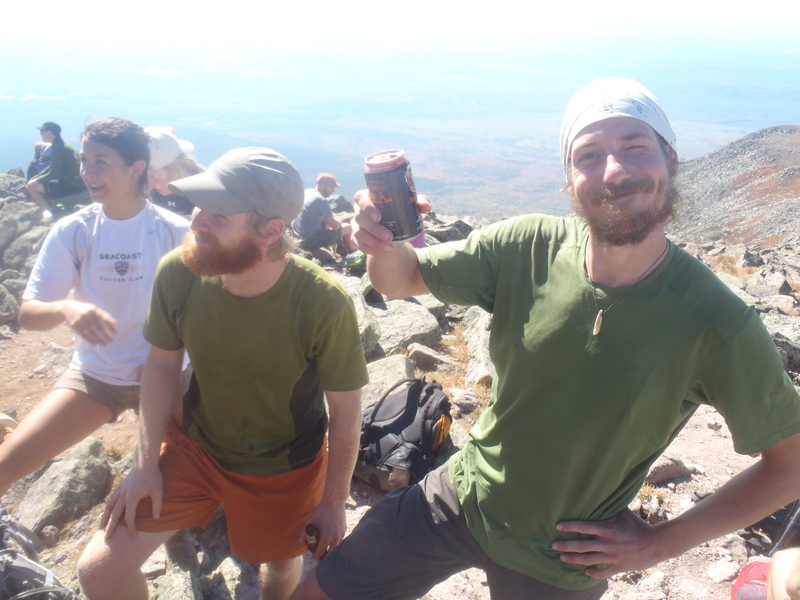 We could see Katahdin, likely only 5 miles as the crow flies to the summit from where we sat drinking a well deserved beer and eating an overpriced cheeseburger. The next day we would climb the big guy and end our journey, which at this point seemed a formality and more symbolic than necessary. We had made it. We had hiked from Springer Mountain, Georgia to Mt Katahdin, Maine and we were a day away from climbing to the summit and ending our journey. We spent our last night on the Appalachian Trail three miles from Abol Bridge, camping under the stars in the shadow of Mt Katahdin. Taking a blue-blazed side trail we found a section called the Blueberry Ledges where the cold and swift Katahdin Stream cut a meandering path through exposed rock slab ledges where only scattered blueberry bushes and stunted cedar trees could grow. The stream not only cut its way through the rock but what resulted made a perfect water slide. How can you pass up a late afternoon waterside after 5 months of hiking on the last day on the trail? The warm sun heated up the rock that we lounged on while all five of us took turns jumping in the water slide, hollering from a mix of excitement and shocking cold. Our last night on the AT seemed to be, in a word, perfect. An afternoon of splashing in the crystal clear water like children in a sprinkler followed up by eating our dinner next to a cozy campfire while telling stories and reflecting on the 2,175 miles we had behind us. No one set up a tent that night, opting instead to sleep under the stars “cowboy style” while the fire slowly turned from flames to coals and finally to ashes while we all dozed the night away in our sleeping bags. 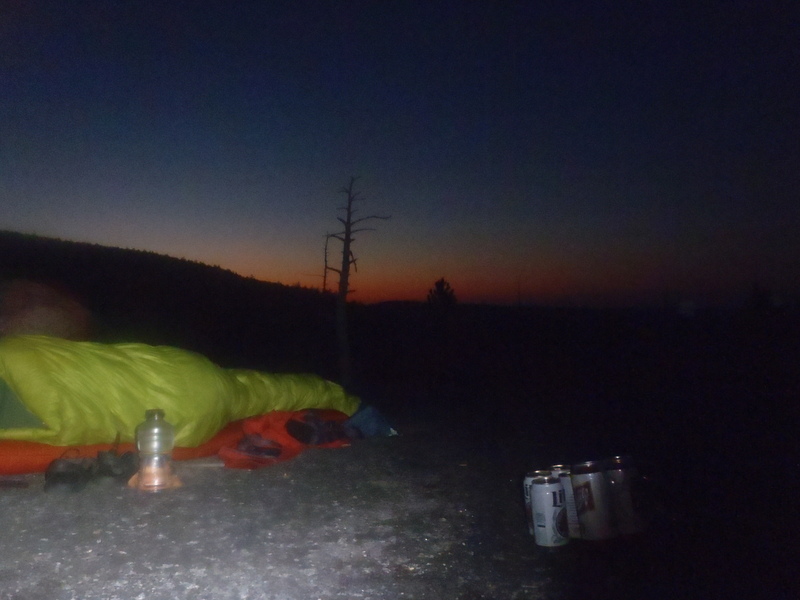 We woke up that morning to watch the sun slowly start silhouetting the back side of Katahdin and turn the sky from a dark purple to waves of yellows and oranges while all still lying in our bags. We sat there, motionless and mostly speechless, soaking in the last sunrise on our AT adventure. Turtle working his way down the near vertical part of the Hunt Trail. We didn’t stop for a single picture on the way up! Eventually though, it was time to make the last climb and end our thru hike. We packed up our gear and hiked to the ranger station and parking lot at the base of the mountain to officially sign in for the last time and drop our packs for the final five miles. After “enjoying” our last oatmeal breakfast and carefully packing our celebratory beers into smaller backpacks we started up the Katahdin Stream Trail. 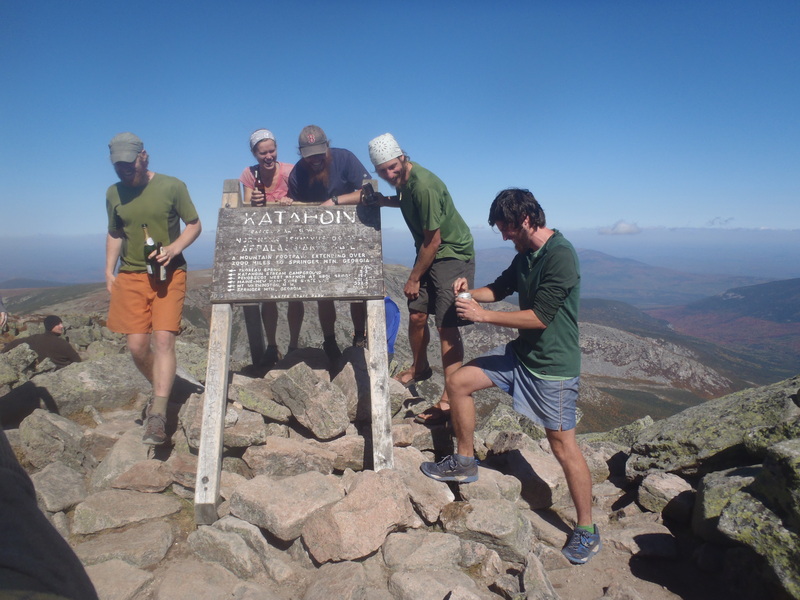 For the past few days we talked about our strategy for the summit of Katahdin. Would we go slow and enjoy it? Would we stop and take breaks to reflect? Would we hike as a group or would people want to take some time to hike by themselves? The consensus was that we would climb as a group but not rush and several people planned on taking extended breaks at a pretty waterfall or a panoramic view. That was the plan until we saw the sign that told us we had four miles to the summit. We couldn’t stop. We couldn’t slow down. We were like a wolf hot on the heels of its prey, completely tunnel visioned on the task at hand and unwilling, almost unable, to slow down. We hit the steep part of the Katahdin ascent, possibly the steepest three miles we had encountered in five months and started sprinting. We passed at least 100 day hikers who climbed Katahdin that morning to appreciate the warm Saturday temperatures and gorgeous fall foliage. We were on a mission, nothing could stand between us and the wooden sign the top of that mountain that we worked five months to touch. I have no idea what it is like to climb Katahdin. Most people thought we were obnoxious show offs speeding up the hill with something to prove. Few actually knew what an Appalachian Trail Thru Hike was, ironic considering they themselves were following white blazes. A small group clapped for us and cheered us on as we passed and a small group gave us dirty looks as we asked to sneak by them. Par for the course I suppose. All I know is that I spent an hour and a half in a fog of adrenaline, excitement and shortness of breath trying to keep up with my wife who turned into some sort of boulder climbing spider monkey with the lungs of a Kentucky Derby horse. 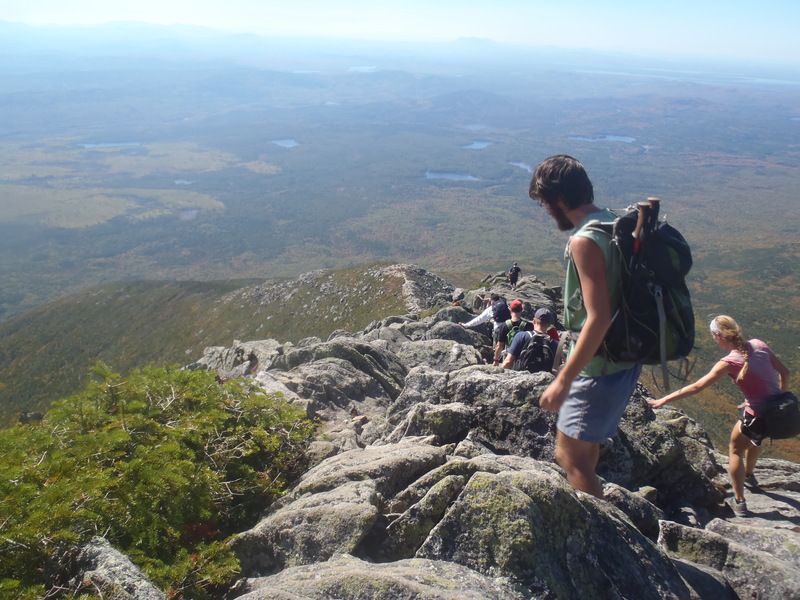 At least fifty people sat at the summit of Baxter Peak, taking what I expected to be a private and serene moment to something I shared with a couple dozen strangers. I also expected the most powerful part to be when we reached the sign. The theme of our hike has turned out to be that we never got what we expected and that lasted right up to the last steps. For me it wasn’t touching the sign, it was the first time we saw it from 100 yards away is when the flood of emotions came up from my tired aching feet and came pretty darn close to bubbling out in tears of joy. That’s where we embraced each other, high fives and hugs all around, knowing that the journey was truly over. Fern Gully stayed to wait for his hiking partner Sunshine who hiked the last two miles with his family and Lindsay, Turtle and I started walking the last 75 steps… and then I started running. I didn’t mean to, I just had to. I ran over scree and basketball sized rocks, throwing the concern of a sprained ankle or bloody fall to the wind. I’ll always remember the look on the face of the pleasant and quite surprised 50-something year old day hiker who politely posed behind the sign for her photo as I came running. I ruined her photo but I couldn’t wait. I jumped in front of the sign, grabbed the sign in two hands and planted a giant kiss on it before I dropped to my knees, still holding onto the frame. By the time I looked up again I had the love of my life tackling me to the ground and planting a giant sloppy kiss on my lips. I’m glad Turtle didn’t take the same congratulatory approach as Lindsay. Fern Gully spraying everyone with our root beer! We sat at the top for a couple hours, taking pictures, drinking beer and champagne but most importantly soaking in the moment. 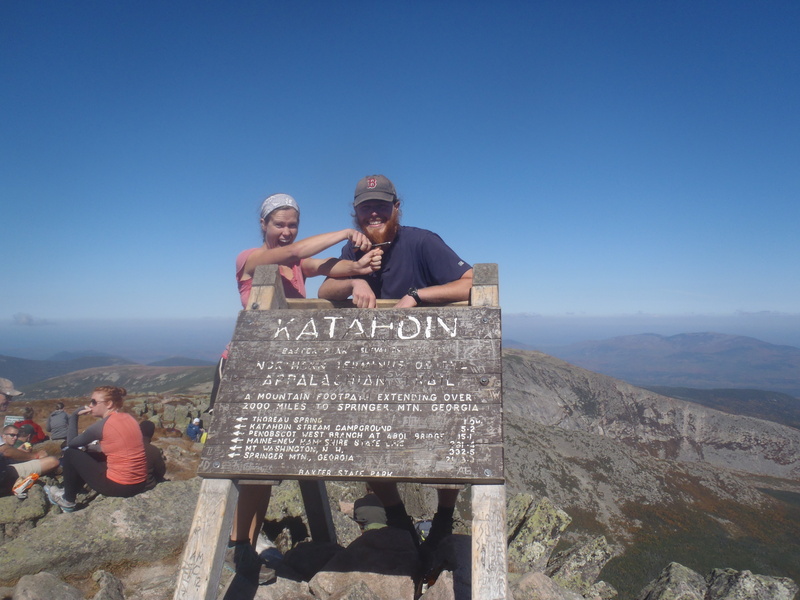 It’s funny, even though our last day on Katahdin is something we will never forget, it was nothing remarkable either. No one had any moments of clarity or life altering epiphanies. We simply walked to the top and walked back to the bottom and at the end of the day took our boots off, put camp shoes on and ate some food. 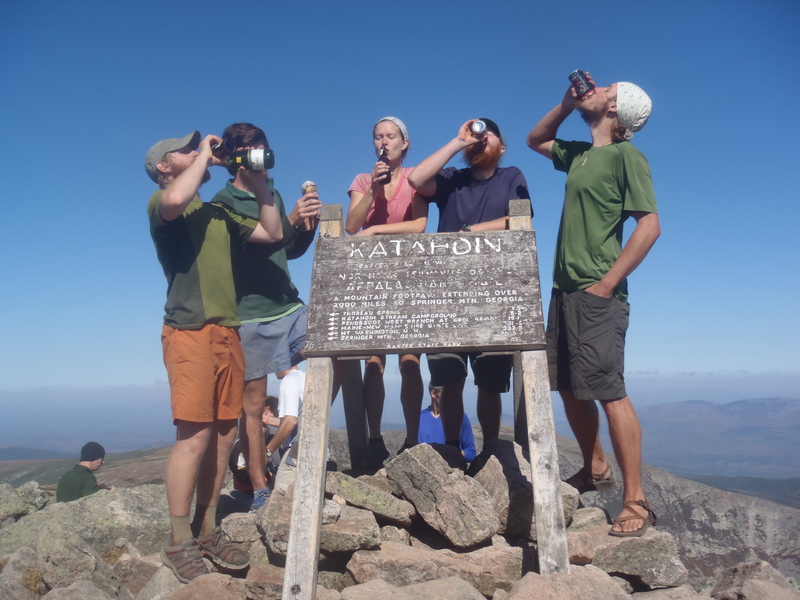 Few people that we personally knew on the trail had their lives figured out and found themselves in some great moment of nirvana by the time they hit the summit of Katahdin. 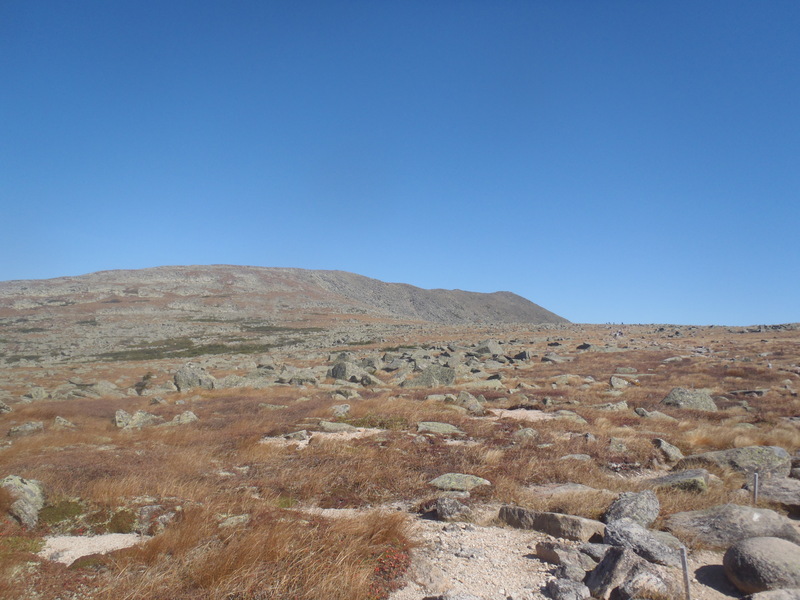 In a perverted version of “Groundhog Day” leaving Springer Mountain,156 days prior, was fundamentally identical to the day we summited Mt Katahdin. Just like on Day 1, we hiked to the top of a mountain not knowing what the next day would hold, leaving everything comfortable that we knew behind and embarking on something new. Day 156 was no different, except for the fact that we would have a flush toilet when we woke up the next day. Something tells me that the reason 750+ people successfully thru hiked this year wasn’t for an epiphany but maybe just the primal simplicity that comes with spending a summer in the woods. Maybe that in itself is a little bit remarkable. The Golden Girls drink their final toast as the journey is finally complete. I’m sad to see the chronicals come to an end, as I’ve really enjoyed following you guys on the trail. Warmest wishes and best of luck on all your future journies and adventures. Hey Beth, we’re actually going to be writing as the winter goes on. Right now we’re putting together some of our bigger picture reflections on the whole journey and will be posting those in the next few days. As we talked about way back in Daleville, I had the idea of writing a book and in the last two weeks it’s been my full time job – having about 13,000 words of a projected 100,000 already written. When it’s ready to be published you guys will have a copy waiting for you in the mail. Thanks for everything you did for us in Virginia and all of the support along the way! Very nice writing… You told the story well Clay. This takes me back to some great memories. Thanks bud, it was fun to write when I could actually sit down and relive the memory and not try to pump out an update in a local library. Great job. This is a worthwhile accomplishment and you should be proud of yourselves and what you’ve accomplished. However now you must be aware that life is a series of adventures and when One adventure and is a new one starts so onward and upward it. Hello Lindsay and Clay, congratulations on having walked the AT. I have enjoyed reading your posts for the last few months and admired your ability to write such enjoyable and informative reports. 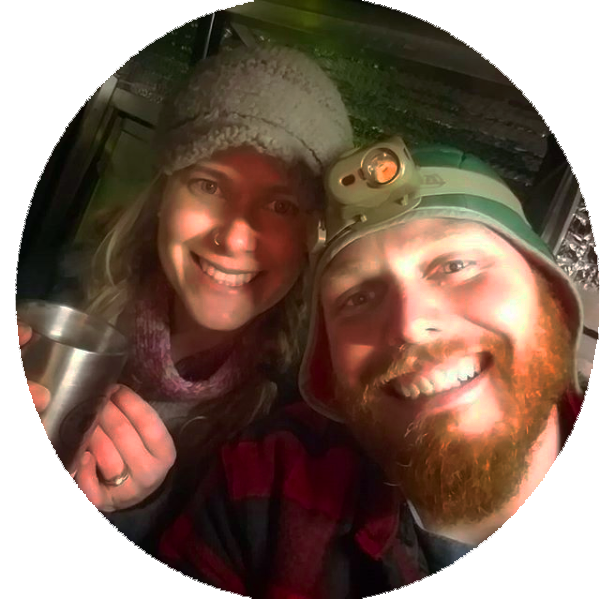 My name is John Lumborg and I am Joanna’s Dad (Chubby Bunny) and the main reason I write is to thank you both for having been a friend and helper to Joanna during much of her 4 months on the AT. It was a comfort to know that she had a couple of friends she could rely on if needed. N.B You have a room to stay in Berlin anytime you may decide Germany is worth a visit. An e-mail is all you need to send. J.